The 2015 CR-V went up against 18 other powerhouse models in its class that had either undergone major changes/updates or were all-new, and its no shock to us that the 2015 CR-V came out on top! The Motor Trend editor-in-chief, Ed Loh, said “The 2015 Honda CR-V impressed our judges with its extensive list of delightful design and thoughtful engineering improvements.” The judges awarded Honda as the SUV of the year based on its Engineering excellence, featuring the new “Earth Dreams” 2.4 Litre i-VTECH engine, as well as efficiency, safety, and the stellar value of the vehicle. “The CR-V shows you don’t have to lose the fun factor when buying something economical” said the Motor Trend Associate Road Test Editor, Carlos Lago. Dave Gardner, Vice President of Sales and Marketing at Honda Canada, had this to say, “It is an honour to receive such a prestigious award from the expert staff at Motor Trend. Our engineers, planners, and dealers work hard to deliver class-leading products to our customers, and it’s extremely rewarding to be recognized for that hard work.” Come in today to Henley Honda to test drive one of our new 2015 Honda CR-V’s, the timing couldn’t be better. 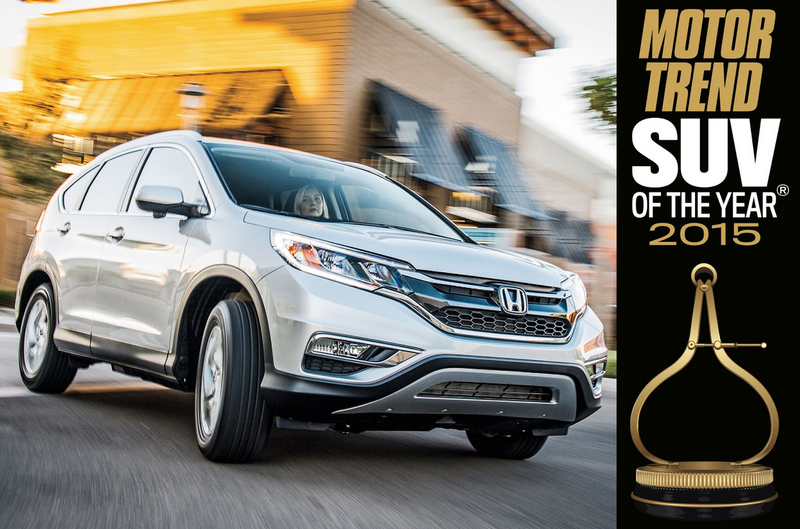 Come on down to Henley Honda and see for yourself why the CR-V is the Vehicle of the Year.